While maintaining a global reach, the Petersen Automotive Museum continually studies the crucial role that this city, and California as a whole, has played in the development of the automobile and its establishment as a cultural artifact. 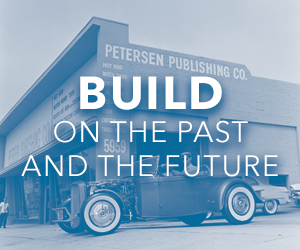 To ensure that the Petersen continues to become the center for automotive thought by presenting mobility’s past, present, and future, we need your support. Free admission and buses for underserved students, Teen Auto Workshop, STEAM classes in the Rob and Melani Walton Discovery Center and our thought-leadership series including the Future of the Automobile conference and expert panels. As our collections and exhibitions grow in size and scope, we update our spaces and technology to maintain our dominance in the automotive space. Everyone builds a relationship with their car — a bond of man (or woman) and machine. Perhaps more importantly, cars connect people and that is where true memories are made. Our collection and exhibition priorities continue to evolve as the automobile itself evolves. As technology advances, additions to the collection are necessary to shape and inform our future exhibitions. Giving over 15,000 K-12 students who qualify for free lunch programs a fully funded field trip to the museum. For many of these students, their visit to the Petersen is often their first experience with museums. Providing 15 students from across the state the opportunity to participate and engage at no cost in the inaugural class of Teen Auto Workshop. Advancing our mission to explore and present the history of the automobile by allowing the vision of an elevated experience of the Vault, presented by Hagerty®, to become a reality. We are deeply grateful to all our supporters who have made an investment in the Petersen Automotive Museum Foundation. Their continued enthusiasm ensures that we can continue to fulfill our mission and fuel the next generation. To be represented on the wall or learn how to get to the next level, please reach out to Alexia Cornett, Associate Development Manager at acornett@petersen.org or 323.964.6353. Over the last year, we have received over 25 vehicle donations. For those with limited space that are looking to make an impact with their vehicles rather than their checkbook, please consider making a car donation to the Petersen. Check out some of the amazing donations we’ve received on our Car Stories blog. If you want to learn more about car donations, please call Mary Brisson at 323.964.6396. Through its generous support, the corporate community has played a significant role in advancing the Petersen's vision of collecting, preserving, interpreting, and exhibiting the most significant vehicles in history. There are a number of ways a company can be engaged with the Petersen and enjoy exclusive access benefits to the Museum. The Petersen Automotive Museum can provide your company with a uniquely valuable partnership and the opportunity to align your brand with a internationally recognized automotive museum. Whether it is through the sponsorship of an exhibition, event, video series, or educational program, or by joining our corporate membership program, Petersen's partners receive exceptional exposure to a broad demographic of visitors and donors, high-profile brand recognition, unique hospitality opportunities, and exclusive events.